Patch is a hybrid gardening/virtual pet game! The type of care you give your seed will influence the kind of pet it becomes after it blooms. Patch has two stages of care: Sprout and Blossom. Begin in the Sprout stage where you will plant your magical seed and care for it until it blooms. You will need to give it the proper amount of water, fertilizer, and sunlight/shade to survive. Once your seedling blooms, you can pick it--revealing the lovely pet you've grown! Once your pet has been given a nickname, you'll enter the Blossom stage caring for your pet with added controls such as pruning and praising. Give your pet lots of love and attention to keep it blooming. Hello~ My name is Emmer, and I'm extremely new to game dev. I work at a university library full-time and work creatively in my spare time! My background is in graphic design with a focus in illustration. I'll be speaking for most of the devlog entries here for the jam; I'm also in charge of the concept, game design, and art assets. aa thank you so much ヽ(；▽；)ノ i'm really putting my heart into it! i hope you'll enjoy it. This is so dang cute! I'm really looking forward to seeing how this comes along! I'm in love with this idea oh my gosh - I can't wait to see how everything comes along! I figured out how to make things look 3d in Photoshop. No one should have given me this weapon... I'm currently trying to keep myself from over-usage, but it does look perfectly in line with the look I was going for. I updated the word mark in my first post to reflect the title screen and sent the mock up for both the title and the main screen menus over to Liam. 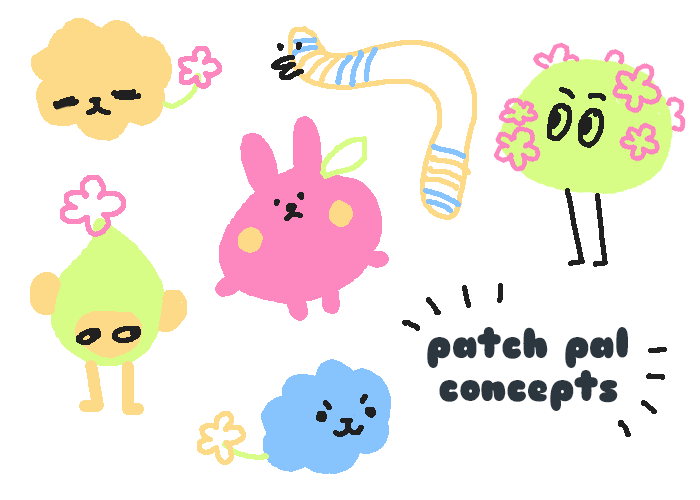 The final part of today's update might be the most exciting...the Patch Pals for the game ❀ I've narrowed it down to two for this jam. On the left is Berry, a Patch pal who loves sunlight but requires lots of pruning. On the right is Chard, they like to lay low in the shade, but require a lot of love. The amount of sunlight you give your seedling will determine whether you get Berry or Chard! I haven't decided if they should be one set color, or if it should be randomized with a few color selections, but you will be able to give them a nickname as soon as they're blooming! Thanks so much for reading!! I'm having so much fun and I hope you are too. I'm going to work on the outline for the rest of the game tonight and tomorrow morning, so hopefully my next update will have some cool thumbnails and lots of game mechanic details. Aw, this is so cute! I look forward to playing it! EMMER THIS IS CUTE AS HELL!!! i love all your art assets so far. i'm looking forward to seeing gameplay!! For the sake of your eyes and mine, I've made a digital replica of my notes from my sketchbook. The originals are in neon green and orange JellyRoll pens. 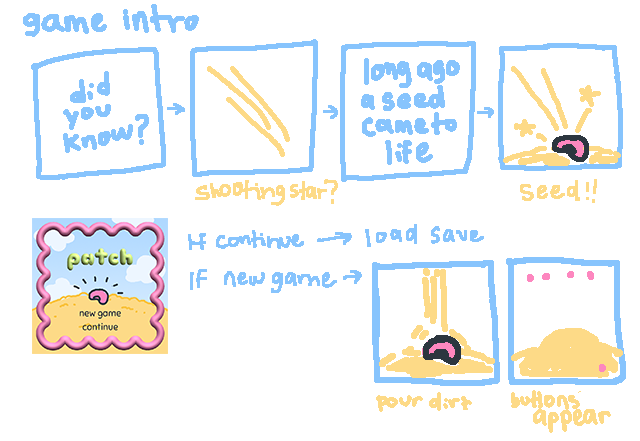 (ﾟｰﾟ; Anyways, first up is the intro notes, I'm going to animate a short sequence where the seed plummets from the sky into the game's main screen. From the title screen, you can load your last save or begin a new game. When starting a new game, dirt will pour in to cover the seed, and the buttons/menu options will appear on screen. 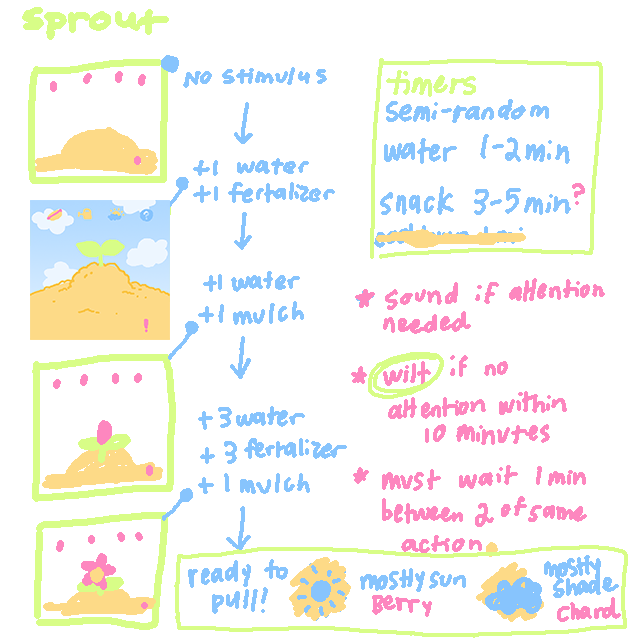 Next up is notes for the Sprout phase. Most of the notes for this phase are technical, and will have to be re-adjusted after testing. I want the Sprout phase to require more attention from the player, finding a length that feels like you're working towards a goal without dragging it on too long. The base actions required for growing your pal is the same for both Berry and Chard. The player's decision to give sunlight or shade the most will control which pal grows. I forgot to write about animations in my notes here, but basically the seedling will wiggle when you click on it or water/feed it! 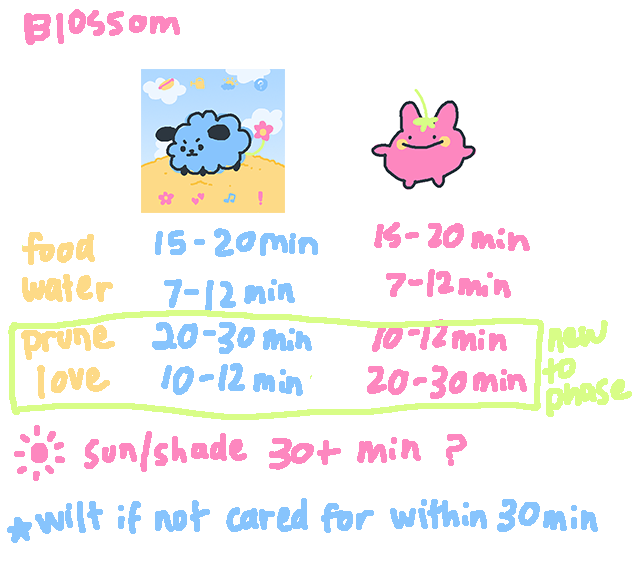 Finally the notes for the Blossom page are the most technically complex. It's mostly going to be a lot of randomized actions that need to be tweaked to see if they're too frequent or not frequent enough. I'm pretty sure at this point the Music/Dance option is getting cut from the jam for the sake of time; I'll keep working hard to se if I can fit it in there!! As for the sunlight/shade option on this phase, I think you'll only need to adjust it infrequently to make sure your pet gets some of the correct one (sun for Berry, shade for Chard). Berry and Chard will hop around or move back and forth during their idle animations and will react with a heart or facial expression when you give them attention! The "wilt" mechanic essentially will be your game over. You'll get the equivalent of a game over screen and be sent back to the main title after you click through. In order to trigger the wilt, your pal will need to be very ill cared for, having had no food, water, love, or pruning within the total time limit. All of this outlining has made me realize....I have no idea if this will work properly until it's running and tested. Ah, this must be what it feels like to make a game. ┐(￣ヮ￣)┌ My dev tells me its possible, but how will we really know if the timing is right until we try it out! I'm sure the kinks will get ironed out as we go.